Sold by Pritam Music Pvt. Ltd. (4.8 out of 5 | 1,780 ratings) and Fulfilled by Amazon. Gift-wrap available. As a child, Bhagat Singh witnessed numerous atrocities committed on fellow Indians by their British rulers. The Jallianwala Bagh massacre made him a freedom fighter. When Lala Lajpat Rai was beaten to death by the police, Bhagat, Rajguru, Sukhdev and others daringly carried out the assassination of a police officer named Saunders which led to their arrest. Bhagat made headlines when he undertook a 63 day fast unto death to improve the conditions of Indian freedom-fighter prisoners. At the age of 23, Bhagat Singh, was a revolutionary who shook up the powerful British government, exposing their true barbaric nature - the man for whom victory lied in his death. This is his story, his legend. The movie dont need a review from me, its a known fact that its the best made file on the legend. I have bought three discs to ensure a good print and now I like to share that the Shemaroo edition is a perfect DVD. Clear picture and sound. If you want to own this movie, buy it from Shemaroo's catalogue. 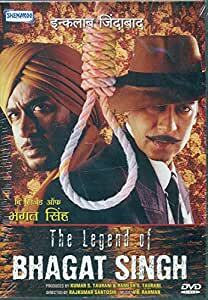 good movie..guess most of story is true...Indians who love their country must watch this...good acting fro m all actors..ty amazon..
Ajay Devgan lovers will prefer it. Emotional and needs a different mood to watch. Mr. Shyamaprasad De, Assistant Professor, V. U. Wonderful film. Amazon service is very nice but a bit late.